Fits: Yamaha MT125 2014, 2015, 2016, 2017 models. Big Bore 304 grade polished stainless steel replacement exhaust system. 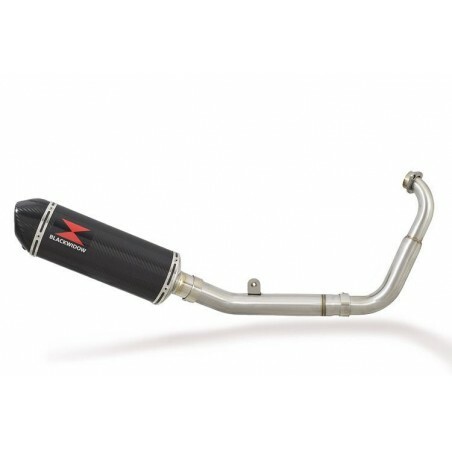 This uses large diameter 34mm downpipe tubing in place of the more restrictive oem Yamaha item. Designed for riders who want to maximise the performance potential of the motorcycle. Removes the restrictive catalytic converter. Replaces the heavy OEM muffler/silencer. Baffle / DB killer is removable. Louder with improved gas flow. Silencer mounting strap, clamp and gasket included. Header/Down pipe Material : 304 grade polished stainless steel. ​See our Silencer Specifications Tab for length & noise levels.